Every year my sermon for Ash Wednesday comes down to one thing: this business of smearing ashes on our faces? It’s for us, not for God. We mark ourselves with a sign of our mortality because we need it, not because God asks it for any transcendent or altrustic moral purposes. Still, with children, the question gets raised: what, really, is it for for them? 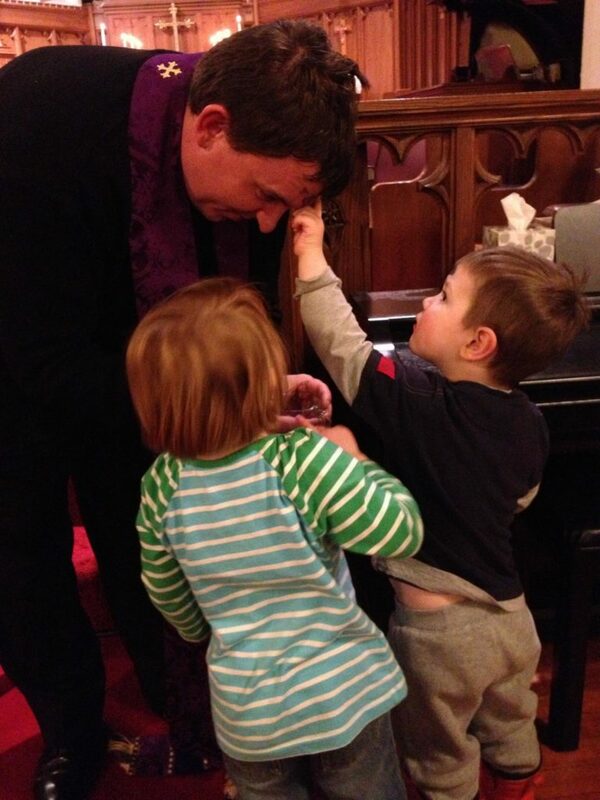 My children are now 9 and 12, and I’m struck by how different Ash Wednesday has felt as they’ve gotten older. As infants, the whole idea seemed preposterous; they were so new, so full of life; what would it help to remind them of their mortality? Or sin? Unlike sharing communion with a very young child, who can understand at a very basic level being fed by the love of God, the message communicated on Ash Wednesday are a bit more obscure. And for me to remember their mortality? It was too painful to think about, and I pushed it away. We had our kids participate in Ash Wednesday because Ash Wednesday is what we do. It’s not about our intellectual grasp of it, it’s about our formation as the people of God, who, like the disciples, are “coming to understand” Jesus as Lord. Nobody gets there all at once; it’s an unfolding. Sara’s husband, the Rev Noah Evans, receives ashes their daughter and a friend (when they were much smaller than they are now!). Now, though, as a parent of older children, sh*t is getting real. As I see them begin to make their way in the world, I know that my most important job is to teach them to walk away from me. In that context? Mortality is a whole different thing. With a baby, as a parent you have the illusion of control. Abstractly you might know it’s an illusion, but you hold on to it anyway. You drive them to daycare (or keep them at home) and they stay in one place until you retrieve them. You know what they eat, how much they sleep, even when they go to the bathroom. You tell yourself that you can protect them from everything; you’ll always be there. Their mortality? Let’s talk about something else. When your child is almost as tall as you are, though, the illusory nature of that fantasy – that you’ll always be there to push them out of the way of the speeding car – that becomes very clear. You do not have that power. You never did. It gets harder to change the subject. With an older child, you are no longer the subject. You are not the one who will decide where they go and what they do. All you can do is trust: trust what you have taught them, trust the decisions they make, trust their skill to care for themselves. And trust God. Trust God a whole lot. This year, my own ashes will remind me of my mortality and fallibility, my desire to control, my sin. And this year, I will continue on the path of letting-go. Not yet teenagers, I know my children have a long way to travel in their spiritual lives. The wonder and joy they’ll encounter – as well as the struggle and heartbreak – will be theirs to confront. Ashes on our faces, we’ll continue facing forward together toward God who takes us as as God’s own beloved dust.